Observation: I don’t know whether something is intended by the bold color choice (flaming red and black), and if so, what, but it’s an interesting alternative to more traditional pink or lavender. Observation: yes, that’s a Stonewall shirt, here. Observation: somebody seems to feel that the shirt is hilarious, a suitable target for mockery. But then the range of images on hilarious.com is pretty wide. Observation: a number of commenters on hilarious.com identify Ian McKellen as Gandalf, period, as if that’s what he had been knighted for. This entry was posted on July 25, 2010 at 2:42 pm and is filed under Formulaic language, Language and sexuality. You can follow any responses to this entry through the RSS 2.0 feed. You can leave a response, or trackback from your own site. To me, there’s a slight difference in connotation between “get used to it” and “get over it”. While the former was intentionally (more than?) a little aggressive in the Gay Pride context, it was not inherently so in its connotations. Certainly, it’s less aggressive in other contexts. For instance, when a couple replaces steak with hamburger on the dinner table in order to save money, “Get used to it” suggests–or at least might suggest–shared suffering and an invitation to be stoic. In contrast, “Get over it!” to me invariably sounds exactly equivalent to “Stop your whining; it’s boring!” If my significant other were to say it to me, my feelings would definitely be hurt. It’s just brutally dismissive. The newer T-shirt doesn’t announce that the wearer is gay; just that “some people” are. It could therefore be worn by anyone, whatever their sexuality. 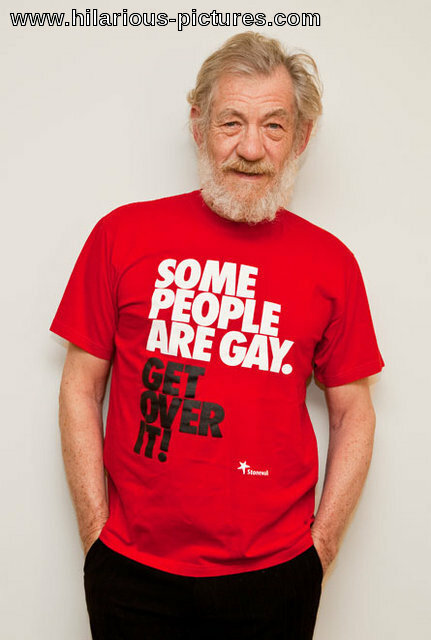 To Rick S: I too have the impression that “get over it” is more peremptory than “get used to it”, and as a result that the version on the Stonewall (U.K.) t-shirts (and posters, buttons, bumper stickers, etc.) is a bracing kick: a mild statement, then a stern order. To Alan Palmer: Nice point. I’m not sure that Stonewall (U.K.) appreciates it, though, since the t-shirts seem to be marketed entirely to an LGBT audience. Of course, it’s entirely possible that they hope that people in this audience will buy t-shirts to give to supportive straight friends. In the UK, the slogan also occasionally appears on the sides of buses and billboards. Stonewall have done well making this a highly prominent campaign. Alan Palmer’s observation is a relevant one here: I think Stonewall have done some publicity stuff getting celebrities (some gay, some not) photographed wearing the T-shirt and making anti-homophobia statements. I suspect that’s not an accident actually. It’s a criticism that’s sometimes made of Stonewall by other more vibrant queer rights groups that Stonewall tends to focus heavily on the rights of Respectable Gays (TM). Certainly there’s very little action or discussion from Stonewall about people who are gender-bending, less binary-conforming, less socially privileged, or trans. So I’m not surprised that they’re using imagery that distance them from more traditional “flamboyant” or “butch” discourse or imagery. I should have said “some publicly out as gay, some not”. Oops. @irrationalpoint: do you really intend the implicature that the celebrities were all gay but not all out? If not, I suggest “celebrities, not necessarily gay” instead. Molly Mooly: no, I meant I didn’t know if they were gay/out or not, because I live under a rock and am ill-informed on matters relating to celebrities (rather than because of cynicism on my part). Your formulation works too. Following up on irrationalpoint’s um … point about getting celebrities, gay or not, to wear the T-shirts, I’d imagine that if the shirts were pink or lavender that might be a step too far for some of them.